This month’s Carnival of Genealogy theme is "The Seasons of Genealogy." 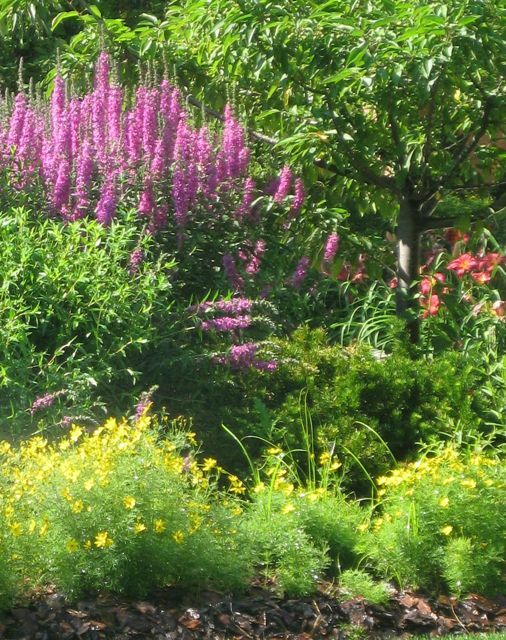 Imagine, if you will, a garden—one of those lush English gardens packed with shrubs and flowers, awash in color (since I’ll never have one of those in real life, I might as well enjoy it in my imagination!). The garden, naturally, changes with the seasons. Winter, the garden sleeps; the seeds wait, then start to germinate. Spring, the shrubs blossom, flowers sprout, and new plants are added. Summer, the flowers bloom in glorious succession amid a backdrop of greenery. Fall, the colors change and late-blooming varieties flourish, while the seeds for next year’s garden drop to the ground. As fall gives way to winter, the cycle starts again. In many ways, that garden represents the seasons of genealogy, too. In my case, the seeds planted by my grandmothers lay dormant for many years. Throughout the winter there were periods of thawing, when my interest would be piqued by something and I would ask questions. Eight or nine years ago I started a genealogy notebook with handwritten family group sheets, notes from a few interviews, and a couple of how-to articles clipped from magazines. Ever so gradually, the seeds took root. I took an online genealogy course in 2007, got some books from the library, and made a couple of exciting discoveries on Ancestry.com. By early 2008, I realized this would be a lasting passion. Spring had come to my neck of the genealogy woods. A garden, of course, needs good soil to grow. My ancestral garden has been fertilized and cultivated with education. I devoured books and magazines, enrolled in the National Genealogical Society Home Study Course, and started attending conferences. I’ve spent one week each at IGHR at Samford University and the Salt Lake Institute of Genealogy, and completed the ProGen Study Group program. All of this has enriched the soil that forms the basis of my research and analytical skills. The result, I hope, is a young but healthy garden. Some of my plants (ancestral lines) are already blooming, while others wait for more attention. Of course I sometimes tire of weeding, get distracted by squirrels, and make mistakes (I had to prune a branch of “former ancestors” last week), but things seem to be growing pretty well. I can identify what I’ve planted in each row, and can cite where it came from and explain why it fits there. Even though I’ve still got some bare spots, it’s satisfying to step back and look at the garden as a whole once in awhile. So where am I, as the seasons go, in my genealogy? I figure I’m pretty close to the beginning of summer, perhaps early June, when sunshine, rain, longer days, and warmer weather converge to create good growing conditions. I can’t yet see all the colors or heights my plants might attain someday, but that’s okay. I’ll keep enriching the beds with education and experience, and do my best to be a responsible gardener. Here at the cusp of summer, it's natural to think that time and persistent research will bring each line into full flower. I hope it will be a long and fruitful season. And fall? It’s hard to see that far ahead, but one day, if all goes well, I should have a mature garden. I hope to keep it thriving as long as possible, because fall is a season of splendor. But the time will come to prepare for another winter, so I have to keep that in mind. I can’t put off writing down the stories of the ancestors I’ve cultivated—or my own story, for that matter. Compiling my knowledge in a readable, manageable way is vital for preservation. And then, who knows? Only time will tell who will pick up the spade and start digging again, reviving the garden in some future spring. Written for the Carnival of Genealogy 107, “Seasons of Genealogy.” Thanks to Bill West of West in New England for hosting this carnival. What a beautiful, beautiful post! Thanks, Debi! Glad you liked it! Very pretty. The picture is nice. I like the comparison to a garden. Very Nice. Okay, you are my new role model. I'm working on the HSC and have attended conferences, but IGHR, SLIG, and ProGen are all on my wish list.